Fragment of an Unstan ware bowl. 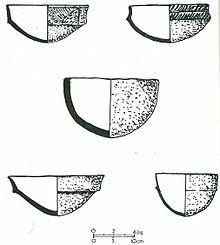 Unstan ware is the name used by archaeologists for a type of finely made and decorated Neolithic pottery from the 4th and 3rd millennia BC. Typical are elegant and distinctive shallow bowls with a band of grooved patterning below the rim, using a technique known as "stab-and-drag". A second version consists of undecorated, round-bottomed bowls. Some of the bowls had bits of volcanic rock included in the clay to make them stronger. Bone tools were used to burnish the surfaces to make them shiny and impermeable. Unstan ware is named after the Unstan Chambered Cairn on the Mainland of the Orkney Islands, a fine example of a stalled chambered tomb in a circular mound, where the style of pottery was first found in 1884. Unstan ware is mostly found in tombs, specifically tombs of the Orkney-Cromarty type. These include the Tomb of the Eagles at Isbister on South Ronaldsay, and Taversoe Tuick and Midhowe on Rousay. Unstan ware has been found occasionally at sites in Orkney other than tombs; for example, the farmstead of Knap of Howar on Papa Westray. Although more recent excavations in Orkney have found Unstan ware to be a more common feature in a domestic context than previously thought, challenging the interpretation of Unstan ware being mainly from tombs. and in the Western Isles, as at Eilean Domhnuill. Unstan ware from Taversoe Tuick. Castleden, Rodney (1987). The Stonehenge People: An Exploration of Life in Neolithic Britain 4700-2000 BC. London: Routledge & Kegan Paul Ltd. ISBN 0-7102-0968-1. Clarke, D.V. (1983). Rinyo and the Orcadian Neolithic, in: O'Connor, A and Clarke, D.V. (Eds.) From the Stone Age to the 'Forty Five. Studies presented to R.B.K. Stevenson. Edinburgh. Jones, Andrew Meirion; Jones, Richard; Tully, Gemma; Maritan, Lara; Mukherjee, Anna; Evershed, Richard; MacSween, Ann; Richards, Colin; Towers, Card. "Prehistoric Pottery from Sites within the Bay of Firth: Stonehall, Crossiecrown, Wideford Hill, Brae of Smerquoy, Muchquoy, Ramberry and Knowes of Trotty". In Richards, Colin; Jones, Richard. The Development of Neolithic House Societies in Orkney. Oxford: Windgather Press. pp. 303–412. ISBN 9781909686892. Hedges, John W. (1984). Tomb of the Eagles: Death and Life in a Stone Age Tribe. New York: New Amsterdam. ISBN 0-941533-05-0. Henshall, Audrey (1972). The Chambered Tombs of Scotland Vol. 2. Edinburgh: Edinburgh University Press. Henshall, Audrey (1985). The Chambered Cairns, in: Renfrew, Colin (Ed.) The Prehistory of Orkney BC 4000-1000 AD. Edinburgh: Edinburgh University Press. ISBN 0-85224-456-8. Laing, Lloyd (1974). Orkney and Shetland: An Archaeological Guide. Newton Abbott: David and Charles Ltd. ISBN 0-7153-6305-0. Reynolds, N.; Ralston, I. (1979). Balbridie, Discovery and Excavation in Scotland 1979. Edinburgh: Council for British Archaeology: Scottish Regional Group. Ritchie, Anna (1985). The First Settlers, in: Renfrew, Colin (Ed.) The Prehistory of Orkney BC 4000-1000 AD. Edinburgh: Edinburgh University Press. ISBN 0-85224-456-8. Ritchie, Anna (1995). Prehistoric Orkney. London: B.T. Batsford Ltd. ISBN 0-7134-7593-5.